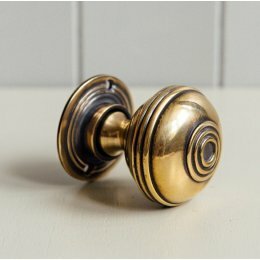 We have a fantastic selection of brass door knobs to add the perfect finishing touches to your contemporary or period home. 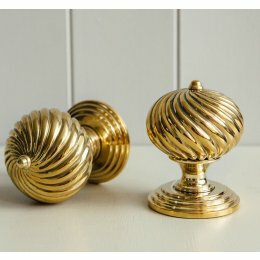 We sell excellent quality brass beehive door knobs and brass cottage door knobs, as well as a collection of period brass door knobs of Edwardian, Victorian and Art Deco styles. Browse for your perfect brass door furniture here or go back to all door knobs. One of the most exciting parts of being a homeowner is the freedom to renovate the rooms in your house so they better suit your personality. From a remodeled living room to a new kitchen, the only limits are your budget and your time. When designing an area of your house, it’s likely that you’re looking at the big picture. From paint colours to flooring and countertops, it’s not uncommon to miss the little things that bring a room together when taking on a large renovation project. However, it’s the small touches that make a big difference in any room and one of the best ways to bring charm into your house is by investing in high-quality door handles. While most people spend a lot of their budget on the larger parts of their renovation, it’s important to set some money aside for the signature pieces that help each room stand apart. Door handles are a timeless addition to any space because they add an extra bit of character and elegance that everyone is going to interact with. They also help bring a room together by supporting a specific theme or design choice. Here at Grace and Glory Home, our door handles perfectly match any room’s style or personality. From metals like brass and nickel, to forged metal, each of our door handles is expertly crafted to surpass your expectations. Our brass lever door handles are perfectly designed for both interior and exterior use. You’ll love our sleek Codsall lever handles with round rose brass with it’s elegant aesthetic and soft feel. If you prefer a period piece, we have our reeded lever handle made with an aged brass or nickel that will have visitors talking. Transform your doorway with one of our forged metal levers. Available in both pewter and black, our metal handles bring an old world charm to your door with their sturdy constructive and gothic design. When you’re deciding on which handle to install, it’s a good idea to think about who’s going to use the door most often. If the door handle is going on a child’s room, then you’re probably going to want to find a durable and easy to use product. This amount of thought also applies to bathroom doors and younger children. It’s the doors you don’t want children to open where you need to install a harder to use handle. Some examples of these types of doors include the basement, or the front and back exterior doors. Another factor to take into account, especially with young children, is choosing a handle that’s easy to clean. Whether in a daycare or a school, children have a lot of germs on them that can be transmitted through door handles. A study of hospital doors found that brass impedes the growth of bacteria and will disinfect itself after several hours. This means that this material is a great choice for door handles for bathroom doors and in children’s rooms. External doors should always have a lock equipped in them. Most homeowners use a deadbolt lock on their outside doors to protect from unwanted guests or intruders. Storm doors usually come built with a smaller lock to prevent entry into a sunroom or other external area connected to the house. Interior door locks are usually less secure than outside doors with deadbolts, and are usually installed on bathroom and bedroom doors. Having a lock on bedroom doors can be risky in emergency situations or if you need to access your child’s room for any reason. When it comes to deciding on door locks, there are a number of considerations you should think about. From the placement of the door, to safety and access, it’s important that you take your time before installing locks. When you’re planning to renovate or remodel your home, you should always remember the small details. A room is made up of more than just walls, floors, and ceilings. By taking the little touches into account, you’ll transform a house into a home. 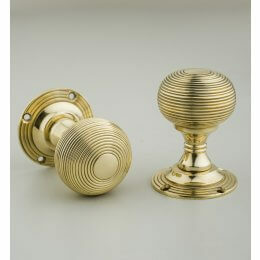 We have a large selection of brass door knobs for any style of house. Whether for internal or external use, our products are the perfect way to add a little charm to any door. You can choose from a beehive design, a Burcot swirl, or a cottage door look for your brass door knob. For the more adventurous homeowners, we have a Georgian square model that stands out from the rest. You could also choose from one of our Regency style Bloxwich products to add extra charm to your entranceways. 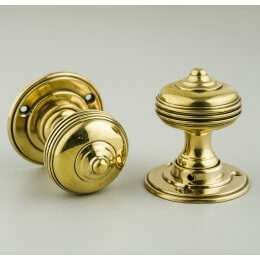 As we mentioned above, brass door knobs are an excellent choice for a number of reasons. Not only does this material look nice on a variety of doors, but brass is also more sanitary than other types of wood or metal. 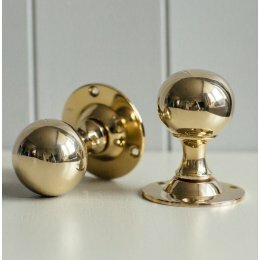 Our selection of brass door knobs is second to none, providing a wide range of options to suit any style. Whether you’re interested in a modern design or something more traditional, we have the perfect product for your home. When you’re trying to decide on the best finish or material for your door knob there are a lot of considerations to take into account. From the design of your entranceway to the character of your room, you need to think carefully on which product will be the best for your needs. For example, if your preferences lean towards a traditional style you would be wise looking at one of our nickel or brass beehive door knobs. Both of these items have a classic design that is perfectly suited for a room filled with vintage furniture and breathtaking antiquities. If you’re a homeowner who enjoys the more contemporary style of design, we recommend looking at our rosewood beehive knobs with nickel collars. You might also be pleased with a statement piece, like our hand forged round pewter door knobs. When it comes to deciding on the perfect door knob for your home, you need to think about your personality and the design you want your house to have. If you have any questions about our products or choosing a door knob, our team of experts are always here to help. People carry a lot of germs on their hands, and whenever they touch an object a lot of those germs spread to it. Of course door knobs aren’t an exception to this rule and can become filled with bacteria causing sickness. If you decide that brass door knobs are the perfect choice for your door, we have some advice to help you keep your family and friends healthy and happy when they come for a visit. As we’ve discussed, brass has the ability to disinfect itself after several hours have passed, reducing the number of germs found on the surface of your door knob. However, to make sure that your product is able to perform this function, you need to remove the coating applied by the manufacturer. 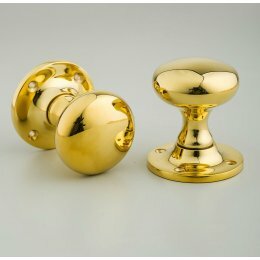 When you buy a brass door knob it has a special coating already on it that helps the product retain it’s shiny design. To take advantage of the disinfecting agents of the brass, you’ll need to strip off this coating by applying paint thinner to the door knob. 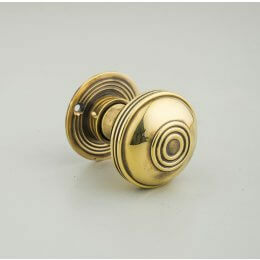 We carry a large selection of door knobs that are made from a number of different materials. While brass is always a popular choice for homeowners, we also carry products crafted from nickel, wood, glass, and ceramic. 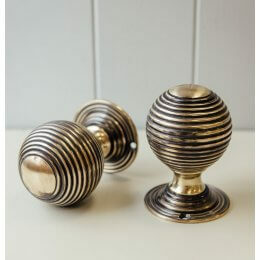 Our selection of brass door knobs provide the perfect finishing touch to your home. 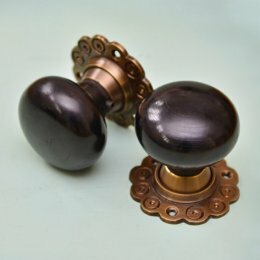 We sell high-quality brass cottage and beehive door knobs, as well as a large collection of period door knobs of Art Deco, Victorian and Edwardian styles. Unsurpassed in quality and finish, our superior catalogue of nickel door knobs are full of charm and elegance. Nickel door knobs are a great choice if you’re looking for the perfect touch to adorn your bedroom or bathroom door with. Fitted with either a brass or nickel collar, our wood door knobs are expertly crafted and refined. Visitors to your home will notice this unique door knob once their hand touches the sturdy wooden finish and elegant design. Glass door knobs are unmatched in their historic beauty and charm. From the subtle design elements to how one of our glass door knobs feels in the hand, once you start using glass in your door handle, it’s hard to go back. Choosing a ceramic door knob from our large selection of products is a great way to add a subtle finishing touch to any room in your house. Available in a variety of colours, our ceramic door knobs are offered in solid porcelain or brass collared. Choosing to purchase and install one of our vintage brass door knobs is a great first step to creating the home you’ve always wanted. Our products will leave a lasting impression on any guest you welcome into your home, creating a feeling of charm that will endure throughout their stay. One of the best parts of choosing a vintage style for your door knob is that there are so many products to select from. 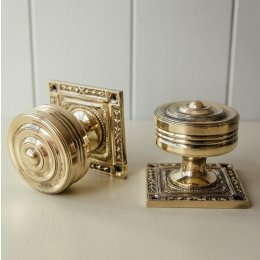 From our popular Georgian square rose door knobs to our Regency style bloxwich design, there are a number of wonderful items to browse through and purchase. Vintage brass, or antique brass, is a metal that has been treated to look as though its over 100 years old. Often distinguished by an almost copper-like appearance and tarnish, this metal is crafted to showcase a style set in an older time. One of the interesting aspects of vintage brass is the detail work that goes into each door knob. From intricate designs to breathtaking patterns, the metal has been expertly crafted to appeal to any homeowner. 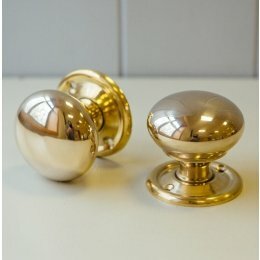 The reason that so many people decide to use brass for their door knobs is because the metal is fairly easy to keep clean and it lasts for a long time. Also, as you can see from our catalogue of door knobs, there are a number of diverse products to choose from. 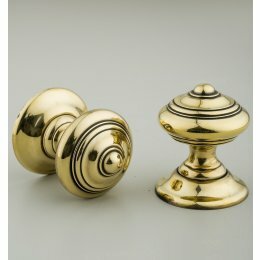 While each of the items is made from brass, the design of the door knobs are as unique as you are. Whether you want a modern product or something more vintage, each of our door knobs are crafted with durability and quality in mind. Aesthetic aside, the other advantage to using brass is the disinfecting nature of the metal. Used in hospitals and nursing homes, the germs and bacteria found on the surface of brass is drastically reduced when compared to other materials. This disinfection process takes several hours, but makes your door knob much cleaner than competing models. Over time, oxidation and other chemical changes can take place in brass and other metals. When this occurs, the brass develops a unique sheen or patina, which looks nice on antique brass because it makes the metal appear more vintage. 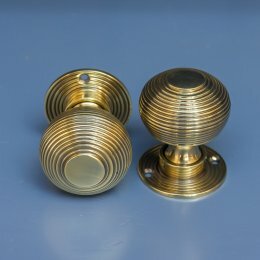 Once you have your brass door knobs installed, you’ll want to make sure you know how to maintain their unique appearance. Using the wrong cleaning method can damage the brass and remove the patina, which is what helps give the metal that antique look. The most effective way to clean your door knobs is to wipe them down with vinegar or lemon juice. These solutions are gentle enough that they won’t damage the metal, but will still clean the surface. Avoid using cleaning products which contain caustic acids or ammonia because these chemicals will erode the metal and can destroy any details in your door knobs. You can use commercial cleaners, however, you have to be careful not to scrub or polish the door knob too hard. 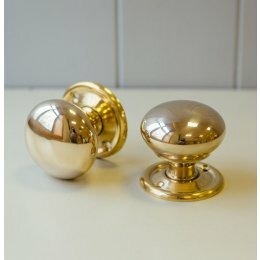 If you decide to purchase a vintage brass door knob you need to remember that the metal shouldn't be shiny or have a lacquered finish. Unlike modern brass, if your vintage door knob has this polished appearance it’s not authentic. To make sure that you get the product you’re looking for, you should always research the door knobs you plan to buy prior to making the purchase. At Grace & Glory Home, all of our items are guaranteed to surpass your expectations and add that extra charm to any room in your home. We believe that door knobs are investments into your home, and we know that you’ll be pleased with your purchase when you choose one of our products. 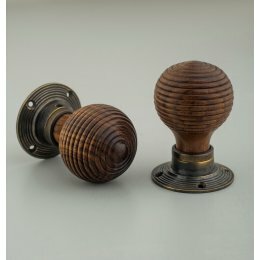 Unlike other providers, our selection of vintage door knobs are unique for any style you prefer. From our ebony bun door knob with aged brass collar and rose, to our rosewood beehive option, the choices are endless and sure to put a smile on your face. 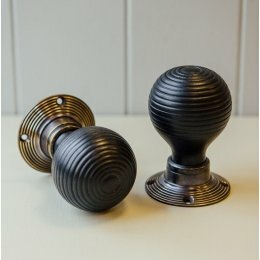 Our line of beehive door knobs have always been popular because of their unique design and signature circular pattern. From contemporary to traditional, the soft lines perfectly accent any home or room. One of the best aspects of the beehive products is that they’re available in a number of different styles, colours, and compositions. 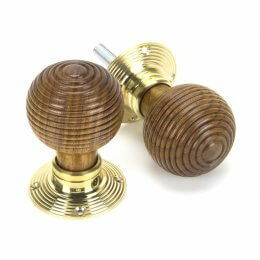 At Grace & Glory Home, we carry beehive door knobs made from brass, nickel or wood. With each of these materials having a unique appeal over the other. Easily identified by the elegant rings that surround the door knob, the beehive design is the perfect way to greet visitors as they enter your house or move into a new area of your home. Beehive door knobs became very popular when it was first designed in the Regency era. This sort of metalwork was also very fashionable during the Victorian period, well into the 20th century. When this style was first manufactured, the beehive door knob consisted of rings that ran along its length. This design wasn’t only meant to be decorative, but was functional because of the superior grip it offered of the door knob because of the reeding details. During the Regency and Victorian eras, using a beehive design represented class and elegance. Due to the beautiful nature of the metalwork, these door knobs would be reserved for the more significant areas of a house, or installed on front doors. 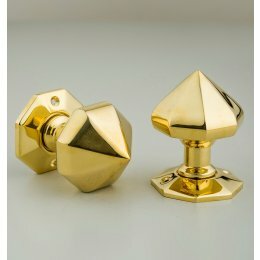 Brass Or Nickel Beehive Door Knobs? When it comes to these antique door knobs, you can find them in many different styles, however, the most common materials is either brass or nickel. In addition to these materials, we also carry beautiful wooden beehive door knobs. 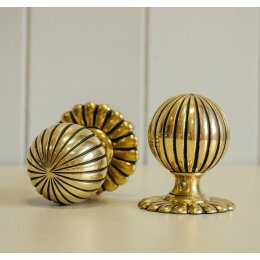 From aged brass to coloured aged brass, our brass beehive door knobs are available in a variety of designs. You can also choose to purchase these products unlacquered, which means that the door knob colour will naturally darken over time. The aged brass collar and rose come in either a dark black finish or a tortoise wood colour. One of the biggest appeals to choosing an aged brass beehive door knob is that it provides an antique aesthetic that draws together different design elements in a room or house. 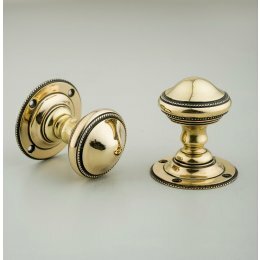 Another advantage to selecting brass beehive door knobs is that metal is able to disinfect itself in several hours, resulting in less germs on the surface. This self-cleaning characteristic makes brass door knobs a great addition to any home. If you prefer a more modern design to your home, then nickel beehive door knobs are an excellent choice. The elegant design of our nickel products are unmatched in quality and style. Available in both a silver or ebony colour, there’s nothing quite like the feel of a solid nickel door knob under your hand as you enter a room. While requiring slightly more care than brass, once you’ve polished your nickel door knob the resulting shine is unmatched in beauty and class. One of the biggest benefits to choosing a nickel door knob is that it’s able to match with most styles and colour palettes, regardless of your preferences. There’s nothing quite like the experience of having wooden door knobs throughout your home. The beehive design looks wonderful when crafted into these products, creating a unique feeling beneath your hand that is unmatched in comfort. Our expertly-crafted wooden door knobs are available in rosewood, ebony or ebonised, with each fitted on a beautiful collar of different designs. These items each look amazing in any room and are a great way to spread warmth throughout your home. 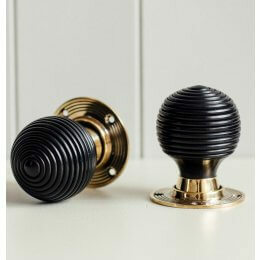 Beehive door knobs are the perfect way to bring together modern design with vintage elements. These unforgettable products are a sure way to have friends and family talking, well after they’ve left your house. If you aren’t sure if nickel or brass is the material for your home, make sure you browse through our wooden door knob page. On here, you can find a wide array of choices that provide a unique option for your doors.